The trident (triśūlābija maṇḍalam), symbol and yantra of Parama Shiva, representing the triadic energies of the supreme goddess Parā, Parā-aparā and Aparā śakti. Kashmir Shaivism or more accurately Trika Shaivism refers to a nondualist tradition of Śaiva-Śakta Tantra which originated sometime after 850 CE. Though this tradition was very influential in Kashmir and is thus often called Kashmir Shaivism, it was actually a pan-Indian movement termed "Trika" by its great exegete Abhinavagupta, which also flourished in Oḍiśā and Mahārāṣṭra. Defining features of the Trika tradition is its idealistic and monistic Pratyabhijnā ("Recognition") philosophical system, propounded by Utpaladeva (c. 925-975 C.E.) and Abhinavagupta (c. 975-1025 C.E. ), and the centrality of the three goddesses Parā, Parāparā, and Aparā. While Trika draws from numerous Śaiva texts, such as the Shaiva Agamas and the Śaiva and Śakta Tantras, its major scriptural authorities are the Mālinīvijayottara Tantra, the Siddhayogeśvarīmata and the Anāmaka-tantra. Its main exegetical works are those of Abhinavagupta, such as the Tantrāloka, Mālinīślokavārttika, and Tantrasāra which are formally an exegesis of the Mālinīvijayottara Tantra, although they also drew heavily on the Kali-based Krama subcategory of the Kulamārga. Kashmir Shaivism claimed to supersede Shaiva Siddhanta, a dualistic tradition which scholars consider normative tantric Shaivism. The Shaiva Siddhanta goal of becoming an ontologically distinct Shiva (through Shiva's grace) was replaced by recognizing oneself as Shiva who, in Kashmir Shaivism's monism, is the entirety of the universe. Shiva and Parvati (which is associated with Shakti), Kashmir, 10 or 11th century. Dating from around 850-900 CE, the Shiva Sutras and Spandakārikā were the first attempt from the Śākta Śaiva domain to present a non-dualistic metaphysics and gnostic soteriology in opposition to the dualistic exegesis of the Shaiva Siddhanta. The Shiva Sutras appeared to Vasugupta in a dream, according to tradition. The Spandakārikā was either composed by Vasugupta or his student Bhatta Kallata. Somananda, the first theologian of monistic Shaivism, was the teacher of Utpaladeva, who was the grand-teacher of Abhinavagupta, who in turn was the teacher of Ksemaraja. The Tantrāloka, Mālinīślokavārttika, and Tantrasāra of the Kashmirian Abhinavagupta (975–1025 CE) are formally an exegesis on the Mālinīvijayottara Tantra, although they also drew heavily on the Kali-based Krama tradition of the Kulamārga. Jayaratha (1150-1200 CE) wrote a commentary on the Tantrāloka. There were no major writers or publications after approximately the 14th century. In the 20th century Swami Lakshman Joo, a Kashmiri Brahmin, helped revive both the scholarly and yogic streams of Kashmir Shaivism. His contribution is enormous. He inspired a generation of scholars who made Kashmir Shaivism a legitimate field of inquiry within the academy. Acharya Rameshwar Jha, a disciple of Joo, is often credited with establishing the roots of Kashmir Shaivism in the learned community of Varanasi. Rameshwar Jha with his creativity, familiarity with the ancient texts and personal experiences provided access to concepts of non-dualistic Kashmir Shaivism. His writings of Sanskrit verses have been published as the books Purnta Pratyabhijna and Samit Swatantram. Swami Muktananda, although not belonging to the direct lineage of Kashmir Shaivism, felt an affinity for the teachings, validated by his own direct experience. He encouraged Motilal Banarsidass to publish Jaideva Singh's translations of Shiva Sutras, Pratyabhijnahrdayam, Spanda Karikas and Vijnana Bhairava. He also introduced Kashmir Shaivism to a wide audience of western meditators through his writings and lectures on the subject. The Vijnana Bhairava Tantra, a chapter from the Rudrayamala Tantra, was introduced to the West by Paul Reps, a student of Joo, by including an English translation in his book Zen Flesh, Zen Bones. Cast as a discourse between the god Shiva and his consort Devi or Shakti, it presents 112 meditation methods or centering techniques (dharanas). Tantric initiation (diksa) is necessary for undertaking the tantric practices of Trika Saivism. Since it is a Tantric tradition, a necessary prerequisite for Trika yogic practice is tantric initiation or diksa. The Mālinīvijayottara Tantra, a major source for the tradition, states: "Without initiation there is no qualification for Saiva yoga." Although domesticated into a householder tradition, Kashmir Shaivism recommended a secret performance of Kaula practices in keeping with its tantric heritage. This was to be done in seclusion from public eyes, therefore allowing one to maintain the appearance of a typical householder. The Yogin who has mastered posture [and] the mind, controlled the vital energy, subdued the senses, conquered sleep, overcome anger and agitation and who is free from deceit, should practise Yoga in a quiet, pleasant cave or earthen hut free from all obstructions. 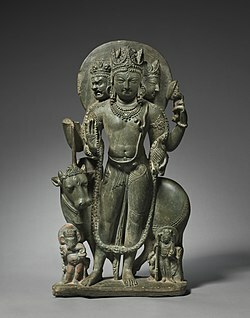 Schist statue of Shiva Mahadeva, Northern India, Kashmir, 8th century, Cleveland Museum of Art. Contemplation of void (vyoman), which bestows all Perfections and liberation. Contemplation of resonance (dhvani), which leads to isolation and liberation. Each of the goals is given specific practices. For example, in the Mālinīvijayottara Tantra, perfecting the Void is said to be reached by moving the mind and vital energy (through the use of mantric resonance) through two groups of three voids located along the central channel (which are also correlated with a system of six cakras), reaching to the region above the head. Different scriptures outline different lists of voids and their location in the body. The practice of resonance deals with various sounds, and how the yogin is to focus on a specific sound and its resonance within the central channel. Regarding mantra, different Saiva tantras and texts teach different mantras and bija (seed) mantras. These mantras are generally intoned (uccara) at different positions in the body along the central channel (such as at the heart, throat, forehead, etc). The Diksottara tantra for example, teaches the intonation of the 'haṃsá' mantra, beginning in the heart region. Some texts teach "a lineal ascent through the heart, the throat, the palate, and the forehead, culminating with the transcendence of sonic experience as the 'Limit of Resonance' [nadanta] in the cranium is pierced." Other texts have the mantric energy follow the breath through the nose outside the body. Two of these have been assimilated from the Tantras of the Siddhanta [1.] the conquest of the reality-levels (tattvajaya), which has been transformed into a radically new type of yoga based on the fifteen levels of the apperceptive process, and, [2.] the yoga of six ancillaries (ṣaḍaṅgayoga), which is taken over with only minor variations. The third is [3.] Kaula yoga with its system of four immersions (pindastha, padastha, rupastha and rupatita) and as a fourth may be counted [4.] the three types of possession (avesa) taught in the Trika (anava, sakta and sambhava) which are innovatively presented as three meta-categories under which all yogic exercises can be subsumed. The Yogin starts by disengaging the mind from external stimuli and then fixes it upon a tattva [such as earth, water, etc] with ever deepening absorption. He attains an internalised vision of the reality, and compares it with his authoritative, scriptural knowledge of the highest level. By means of tarka [reasoning], an ontological value judgement, he discerns that it is different from Siva and thus transcends it. The Yogin’s ascension inevitably brings him to the reality which is Siva at the zenith of all paths. Contemplating in the heart a lotus with colour of the rising sun, with eight petals containing the [eight bhavas] of dharma etc., and a pericarp, [the Yogin’s] intellect becomes steady within a month. Within six he becomes a knower of the Sruti (scripture). Within three years he himself becomes an author of scriptures. Contemplating his own [physical] form there (in the heart), he perceives the principle of intellect. Trika yoga generally uses a system of six "limbs" or ancillaries (aṅgas) which are seen as subsidiary to the principle conquest of the tattvas. This system was adopted from the dualistic Saiva Siddhanta as well as in Pāñcarātra scriptures such as the Jayakhyasamhita. According to Somadeva Vasudeva, in Trika, ṣaḍaṅgayoga "is to be understood as a collection of helpful or even indispensable yogic techniques which enable the prospective Yogin to achieve the required “coalescence” or “identification” (tanmayata, lit. the “consisting-of-that-ness”) with the object of contemplation." Prānāyāma, control of the "breath" or "vital energy" (prana), includes various forms of inhalation, exhalation, kumbhakah, as well as proper posture (asana), defined as either lotus or some other seated posture. The practice of udgatha (eruption) is also taught, which is a "process whereby the retained air is propelled or launched upwards from the navel-region so that it strikes the head." Dhāranā (fixations or concentrations). Four are taught: Fire, Water, Sovereign (defined as bindu and nada) and Nectar (fixating upon a lunar disc above the cranium which drops divine nectar into the central channel, filling the body). Tarka (judgment or reasoning), defined as "the ascertainment of what is to be cultivated and what is to be rejected." Dhyāna (meditation), defined as "attentive contemplation on Siva" or "a focused stream of awareness directed towards the judged and thus accepted reality". Samādhi, a deep absorption that arises from prolonged (the text states 48 minutes) and "firmly established" meditation, in which the yogin "becomes as though non-existent. He reaches a state where he becomes as though dead, from which even intense sounds and other such [sense data] cannot rouse him." In the Mālinīvijayottara Tantra (chapter 17), these are seen as six progressive steps leading to complete identification with the object of meditation. It is important to note that different Saiva tantras outline different forms of the six ancillaries, and "there is no consensus as to their order, their definition or even their subdivisions" among the different tantras. The practice of utkranti, also called "yogic suicide", is also taught in nondual Saiva Tantras like the Mālinīvijayottara Tantra, which uses the vital energy rising through the central channel to end one's life and proceed to union with Siva. The text says that this abandonment of the body can be done at the end of one's life, after one has mastered all that one has set out to achieve. While most other paths observe offering incense and external objects to the deity, this path takes on to offering breaths. The individual controls his heart and pulse by reducing it significantly. The final stage is renouncing consumption of food and water. As a result, he/she connects the state of the supreme in the form of Shiva which results in purification of the body and generation of ojas. The philosophy of Trika Shaivism is called Pratyabhijñā (Recognition) and it is mainly a nondual idealistic and monistic theism. It is influenced by the works of the Saiva monist Vasugupta (~800 – 850 CE) and numerous Śaiva scriptures such as the Agamas and Śaiva-Śakta Tantras.The Trika philosophical system of Pratyabhijñā is presented in the works of Somānanda (c. 900-950 C.E. ), Utpaladeva (c. 925-975 C.E. ), Abhinavagupta (c. 975-1025 C.E.) and his disciple Kshemarāja (c. 1000-1050). According to Christopher Wallis, the philosophy of Trika Shaivism also adopted much of the ontological apparatus of Sāṅkhya school, such as its system of 25 tattvas, expanding and reinterpreting it for its own system of 36 tattvas. Another important source for Trika is the idealistic and dualistic theism of Shaiva Siddhanta. The Saivas also were influenced by the work of Buddhist Vijñānavāda and Pramanavada philosophers, especially Dharmakirti, who was also taken as a primary non-Saiva opponent and whose doctrines were sometimes absorbed into the Pratyabhijñā system. The philosophy of Recognition, as outlined by thinkers like Utpaladeva, teaches that though the identity of all souls is one with God (Isvara) or Shiva (which is the single reality, Being and absolute consciousness), they have forgotten this due to Maya or ignorance. However, through knowledge one can recognize one's authentic divine nature and become a liberated being. Another important element of Trika theology is the active and dynamic nature of consciousness, which is described as the spontaneous vibration or pulsation (spanda) of universal consciousness, which is an expression of its freedom (svātāntrya) and power (Śakti). Because of this, though this philosophy is idealist, it affirms the reality of the world and everyday life, as a real transformation (parinama), manifestation or appearance (ābhāsa) of the absolute consciousness. The Absolute is also explained through the metaphor of light (prakasha) and reflective awareness (vimarsha). All that exists, throughout all time and beyond, is one infinite divine Consciousness, free and blissful, which projects within the field of its awareness a vast multiplicity of apparently differentiated subjects and objects: each object an actualization of a timeless potentiality inherent in the Light of Consciousness, and each subject the same plus a contracted locus of self-awareness. This creation, a divine play, is the result of the natural impulse within Consciousness to express the totality of its self-knowledge in action, an impulse arising from love. The unbounded Light of Consciousness contracts into finite embodied loci of awareness out of its own free will. When those finite subjects then identify with the limited and circumscribed cognitions and circumstances that make up this phase of their existence, instead of identifying with the transindividual overarching pulsation of pure Awareness that is their true nature, they experience what they call “suffering.” To rectify this, some feel an inner urge to take up the path of spiritual gnosis and yogic practice, the purpose of which is to undermine their misidentification and directly reveal within the immediacy of awareness the fact that the divine powers of Consciousness, Bliss, Willing, Knowing, and Acting comprise the totality of individual experience as well—thereby triggering a recognition that one’s real identity is that of the highest Divinity, the Whole in every part. This experiential gnosis is repeated and reinforced through various means until it becomes the nonconceptual ground of every moment of experience, and one’s contracted sense of self and separation from the Whole is finally annihilated in the incandescent radiance of the complete expansion into perfect wholeness. Then one’s perception fully encompasses the reality of a universe dancing ecstatically in the animation of its completely perfect divinity. This single supreme reality is also sometimes referred to as Aham (the heart). It is considered to be a non-dual interior space of Śiva, support for the entire manifestation, supreme mantra and identical to Śakti. Kali, ca. 9th century, from Andhra Pradesh. The Trika synthesis of Abhinavagupta also adopted the doctrines of the Krama school of Shakta Tantra, whose main goddess was Kali. Three realities: Śiva (The Supreme Transcendent), Śakti (immanent in creation, the link between the macrocosm and the microcosm) and Aṇu (the limited atom or individual, a complete image of the ultimate, the microcosm of the macrocosm). Three powers: Icchā (will), Jñāna (knowledge), and Kriyā (action). Any action of any being, including God, is subject to these three fundamental energies. Iccha or Will is in the beginning of any action or process. Jnana by which the action is clearly expressed first in mind, before it is put into action. Then comes Kriyā, the energy of the action. The three impurities: āṇavamala, māyā, karma. Kashmir Shaivism and Advaita Vedanta are both non-dual philosophies that give primacy to Universal Consciousness (Chit or Brahman). In Kashmir Shaivism, all things are a manifestation of this Consciousness, but the phenomenal world (Śakti) is real, existing and having its being in Consciousness (Chit). According to Mark S. G. Dyczkowski, Kashimiri Trika Shaivism looks to three scriptures "as its primary authorities", the Mālinīvijayottara Tantra, the Siddhayogeśvarīmata and the Anāmaka-tantra. As a monistic tantric system, Trika Shaivism, as it is also known, draws teachings from shrutis, such as the monistic Bhairava Tantras, Shiva Sutras of Vasugupta, and also a unique version of the Bhagavad Gītā which has a commentary by Abhinavagupta, known as the Gitartha Samgraha. Teachings are also drawn from the Tantrāloka of Abhinavagupta, prominent among a vast body of smritis employed by Kashmir Shaivism. In general, the whole written tradition of Shaivism can be divided in three fundamental parts: Āgama Śāstra, Spanda Śāstra and Pratyabhijñā Śāstra. 1. Āgama Śāstra are those writings that are considered as being a direct revelation from Siva. These writings were first communicated orally, from the master to the worthy disciple. They include essential works such as Mālinīvijaya Tantra, Svacchanda Tantra, Vijñāna Bhairava Tantra, Netra Tantra, Mṛgendra Tantra, Rudrayāmala Tantra, Śivasūtra and others. There are also numerous commentaries to these works, Śivasūtra having most of them. 2. Spanda Śāstra, the main work of which is Spanda Kārikā of Bhatta Kallata, a disciple of Vasugupta, with its many commentaries. Out of them, two are of major importance: Spanda Sandoha (this commentary talks only about the first verses of Spanda Kārikā), and Spanda Nirṇaya (which is a commentary of the complete text). 3. Pratyabhijñā Śāstra are those writings which have mainly a metaphysical content. Due to their extremely high spiritual and intellectual level, this part of the written tradition of Shaivism is the least accessible for the uninitiated. Nevertheless, this corpus of writings refer to the simplest and most direct modality of spiritual realization. Pratyabhijñā means "recognition" and refers to the spontaneous recognition of the divine nature hidden in each human being (atman). The most important works in this category are: Īśvara Pratyabhijñā, the fundamental work of Utpaladeva, and Pratyabhijñā Vimarśinī, a commentary to Īśvara Pratyabhijñā. Īśvara Pratyabhijñā means in fact the direct recognition of the Lord (Īśvara) as identical to one's Heart. Before Utpaladeva, his master Somānanda wrote Śiva Dṛṣṭi (The Vision of Siva), a devotional poem written on multiple levels of meaning. ^ a b Dyczkowski, Mark S. G. The Doctrine of Vibration: An Analysis of the Doctrines and Practices of Kashmir Shaivism, Motilal Banarsidass Publ., 1989, p. 12. ^ a b Sanderson, Alexis. "The Śaiva Literature." Journal of Indological Studies (Kyoto), Nos. 24 & 25 (2012–2013), 2014, pp. 52-53. ^ Sanderson, Alexis. "The Hinduism of Kashmir." June 9, 2009. pg.31-32. ^ Lalan Prasad Singh (2010). Tantra, Its Mystic and Scientific Basis. Concept Publishing Company. pp. 9–. ISBN 978-81-8069-640-4. ^ Swami Parmeshwaranand (2004). Encyclopaedia of the Śaivism. Sarup & Sons. pp. 32–. ISBN 978-81-7625-427-4. ^ Sanderson, Alexis. "The Śaiva Literature." Journal of Indological Studies (Kyoto), Nos. 24 & 25 (2012–2013), 2014, pp. 53, 59, 61, 68. ^ Vasudeva, Somadeva, The Yoga of the Mālinīvijayottara Tantra, Critical edition, translation & notes p. 244. ^ Vasudeva, Somadeva, The Yoga of the Mālinīvijayottara Tantra, Critical edition, translation & notes p. 248. ^ Vasudeva, Somadeva, The Yoga of the Mālinīvijayottara Tantra, Critical edition, translation & notes, pp. 256-261. ^ Vasudeva, Somadeva, The Yoga of the Mālinīvijayottara Tantra, Critical edition, translation & notes, p. 266. ^ Vasudeva, Somadeva, The Yoga of the Mālinīvijayottara Tantra, Critical edition, translation & notes, p. 279. ^ Vasudeva, Somadeva, The Yoga of the Mālinīvijayottara Tantra, Critical edition, translation & notes, pp. 284-85. ^ Vasudeva, Somadeva, The Yoga of the Mālinīvijayottara Tantra, Critical edition, translation & notes, pp. 286-87. ^ Vasudeva, Somadeva, The Yoga of the Mālinīvijayottara Tantra, Critical edition, translation & notes, pp. 368-69. ^ Vasudeva, Somadeva, The Yoga of the Mālinīvijayottara Tantra, Critical edition, translation & notes, pp. 293-94. ^ Vasudeva, Somadeva, The Yoga of the Mālinīvijayottara Tantra, Critical edition, translation & notes, p. 298. ^ Vasudeva, Somadeva, The Yoga of the Mālinīvijayottara Tantra, Critical edition, translation & notes, p. 353. ^ a b Vasudeva, Somadeva, The Yoga of the Mālinīvijayottara Tantra, Critical edition, translation & notes, pp. 367-370. ^ Vasudeva, Somadeva, The Yoga of the Mālinīvijayottara Tantra, Critical edition, translation & notes, pp. 367-375. ^ Vasudeva, Somadeva, The Yoga of the Mālinīvijayottara Tantra, Critical edition, translation & notes, p. 403. ^ Vasudeva, Somadeva, The Yoga of the Mālinīvijayottara Tantra, Critical edition, translation & notes, p. 417. ^ Vasudeva, Somadeva, The Yoga of the Mālinīvijayottara Tantra, Critical edition, translation & notes, pp. 433-434. ^ Vasudeva, Somadeva, The Yoga of the Mālinīvijayottara Tantra, Critical edition, translation & notes, p. 376. ^ Vasudeva, Somadeva, The Yoga of the Mālinīvijayottara Tantra, Critical edition, translation & notes, p. 437. ^ Vasudeva, Somadeva, The Yoga of the Mālinīvijayottara Tantra, Critical edition, translation & notes, p. 442. ^ Dyczkowski, Mark S. G. The Doctrine of Vibration: An Analysis of the Doctrines and Practices of Kashmir Shaivism, Motilal Banarsidass Publ., 1989, p. 17. ^ Dyczkowski, Mark S. G. The Doctrine of Vibration: An Analysis of the Doctrines and Practices of Kashmir Shaivism, Motilal Banarsidass Publ., 1989, p. 19-20. ^ Torella, Raffaele. 1992. “The Pratyabhijñā and the Logical-Epistemological School of Buddhism“ in Ritual and Speculation in Early Tantrism: Studies in Honor of Andre Padoux. Albany: SUNY Press. ^ Dyczkowski, Mark S. G. The Doctrine of Vibration: An Analysis of the Doctrines and Practices of Kashmir Shaivism, Motilal Banarsidass Publ., 1989, p. 17-18. ^ Dyczkowski, Mark S. G. The Doctrine of Vibration: An Analysis of the Doctrines and Practices of Kashmir Shaivism, Motilal Banarsidass Publ., 1989, p. 24. ^ Dyczkowski, Mark S. G. The Doctrine of Vibration: An Analysis of the Doctrines and Practices of Kashmir Shaivism, Motilal Banarsidass Publ., 1989, p. 25. ^ Dyczkowski, Mark S. G. The Doctrine of Vibration: An Analysis of the Doctrines and Practices of Kashmir Shaivism, Motilal Banarsidass Publ., 1989, p. 26. Basham, A. L. (1989). Zysk, Kenneth (ed.). The Origins and Development of Classical Hinduism. New York: Oxford University Press. ISBN 0-19-507349-5. Muller-Ortega, Paul E. (2010). Triadic Heart of Siva: Kaula Tantricism of Abhinavagupta in the Non-Dual Shaivism of Kashmir. Suny press. Mishra, Kamalakar (1999). Kashmir Saivism, The Central Philosophy of Tantrism. Sri Satguru Publications. ISBN 81-7030-632-9. Shankarananda, Swami (2003). Consciousness is Everything, The Yoga of Kashmir Shaivism. Shaktipat Press. ISBN 0-9750995-0-7. Hughes, John. Self Realization in Kashmir Shaivism. ISBN 0-7914-2179-1. Toshkani, (Proceedings Edited by) SS (2002). Lal Ded: The great Kashmiri Saint-poetess, Proceedings of the National Seminar Conducted by Kashmir Education, Culture and Science Society, November 12, 2000. B-36 Pamposh Enclave, New Delhi-110048: APH Publishing Corporation. ISBN 81-7648-381-8. Muktananda, Swami (2000). Play of Consciousness – A Spiritual Autobiography. SYDA Foundation. ISBN 0-911307-81-8. Muktananda, Swami (1980). Secret of the Siddhas. SYDA Foundation. ISBN 81-86693-07-6. Durgananda, Swami; Brooks; et al. (1997). Meditation Revolution. Agama Press. ISBN 0-9654096-1-9. Singh, Jaideva (2000). Śiva Sutras – The Yoga of Supreme Identity. Delhi: Moltilal Banarsidass. ISBN 81-208-0406-6. Singh, Jaideva (2005). Spanda-Kārikas - The Divine Creative Pulsation. Delhi: Moltilal Banarsidass. ISBN 81-208-0821-5. Singh, Jaideva (2008). Pratyãbhijñahṛdayam - The Secret of Self-Recognition. Delhi: Moltilal Banarsidass. ISBN 978-81-208-0323-7. Wikimedia Commons has media related to Kashmir Shaivism. This page was last edited on 22 March 2019, at 03:23 (UTC).